My bro, amazing food and coffee, of course! Since the first year of my life I celebrated by birthday with my brother Rob who happens to be 9 years and two days older than me. This year we celebrated at Legume in Regent Sq. The food was absolutely amazing. I’ve had the chance to get to know Trevett (chef and owner) shopping every Saturday at the East Liberty Farmer’s Market. It’s not surprising that the food is amazing – fresh and local. But getting to know Trevett; his passion and personality shine through in his food. OMG!!! We finished a few bottles of tasty vino, – sparkling to toast, Vouray with appetizers and a great red with dinner – Nero D’Avola, Sicilia. 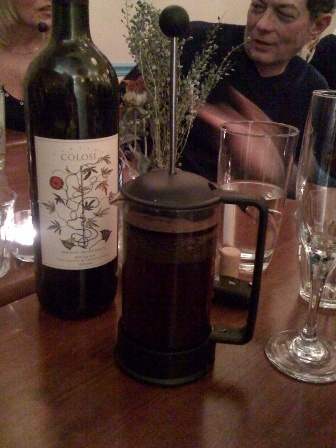 In the true Legume, Trevett way, the coffee was served to our table in a French Press to go with (smoke a cig after) desserts! In my view, a great restaurant is also a restaurant that attends to it’s coffee. Trevett – yo! Rob you are still older than me , phew, and my idol! Btw, Rob is the guy who bakes all our bread for Tazza D’Oro. He is a 3rd generation baker! In fact, we spent part of the night telling stories of the birthday cakes our dad used to make for us. We miss those cakes! 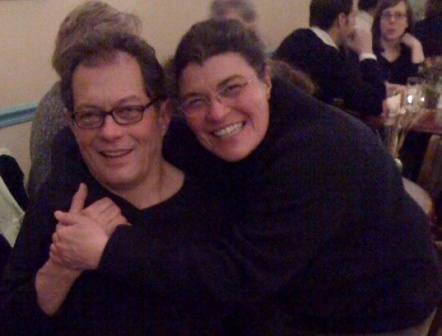 Amelia, Renee, Rick and Gerda – what a great night, grazie! Happy Birthday Amy & Rob! Cheers!